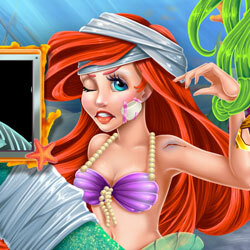 Description: Oh no, the mermaid princess got herself in trouble again, she got injured while escaping a shark attack! Take her to the underwater hospital, cut off the net she's trapped in, remove the splinters, disinfect her injuries and give her the right treatment. With your help she'll be back to treasure hunting in no time!